Peter of les Vaux-de-Cernay is one of the most important sources for the Albigensian Crusades. It is likely that he traveled with the Crusader armies of Simon de Montfort, and was an eyewitness to many of the events he describes. He also supports the crusaders wholeheartedly, and often portrays their enemies in a very negative light. The following portion, from sections 168 to 192 of chapter 7, of his work Historia Albigensis, deals with the siege of Termes in 1210. 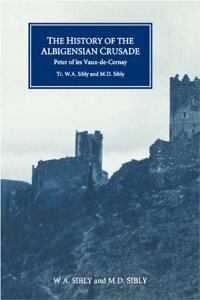 For another version of this siege, please see the account by The Song of the Cathar Wars: The History of the Albigensian Crusade. The Count proposes to besiege Termes. At this time a crusader of noble rank, William of Cayeux, arrived from France, with some other crusaders. The Count was told that a large force of Bretons was on its way. After taking counsel with his followers, and trusting in God’s help, the Count led his forces to besiege Termes. Whilst he was on his way, the knights in Carcassonne had some siege-engines that were in the city hauled out and placed outside the walls, ready to follow behind the Count who was pressing on to start the siege. When our enemies at Cabaret heard that the siege-engines were now lying unprotected outside Carcassonne, they sent a large force of armed men during the night with the intention of disabling them by attacking them with axes. When they arrived, our men came out from the city, and though few in number bravely attacked them and put them to flight, and pursued the fugitives for a long way in all directions. Even so the fury of our adversaries continued unabated; they came back that same night, as dawn appeared, still hoping to disable the engines. Seeing this, our men came out and pursued them, even further and more energetically than. before. They captured Peter-Roger, the lord of Cabaret, two or three times; but fearing for his safety he joined our men in shouting ‘Montfort! Montfort!’ as if he were on our side. So he escaped and fled into the hills, returning to Cabaret only after two days had elapsed. The Bretons whom I mentioned above reached Castelnaudary on their way to join the Count. This place was in the territory of Toulouse and still controlled by the Count of Toulouse. The townsmen refused to allow them into the town, but compelled them to pass the night in the fields and gardens; indeed the Count of Toulouse continued surreptitiously to hinder Christ’s business as much as he could. When the Bretons reached Carcassonne they followed our Count on his way to besiege Termes, taking the siege-engines with them. Description of Termes. The castrum of Termes was in the territory of Narbonne, five leagues from Carcassonne. It was marvellously, indeed unbelievably, strong and in human estimation appeared to be quite impregnable. It was situated on the summit of a very high peak, overlooking a huge natural cliff, and surrounded on all sides by very deep and inaccessible ravines, with water flowing through them, surrounding the whole castrum. In turn the ravines were surrounded by huge crags, so difficult to climb down from that anyone wishing to approach the walls would need first to throw himself into a ravine and then as it were `crawl back towards heaven’. Moreover, a stone’s throw from Termes itself, there was a crag on whose summit there was a small but very strong fortified tower known as `Termenet’. So situated Termes could be approached from one side only, where the rocks were lower and less inaccessible. The lord of this place was a knight named Raymond who as an old man had become given over to a reprobate mind; a manifest heretic who (to describe his evil nature in a few words) feared not God neither regarded man. So confident was he in the strength of his castrum that from time to time he was prepared to take up arms against the King of Aragon, the Count of Toulouse or his overlord the Viscount of Beziers. When this tyrant heard that our Count planned to besiege Termes he gathered together as many knights as he could, filled the castrum with large stores of food and whatever else he needed for its defence and prepared to withstand the siege. Siege of Termes. Arriving at Termes, our Count started the siege with a modest force and was able to occupy a small part of the castrum. The defenders, numerous and well protected, showed no fear of our modest army; they were able to come and go freely to obtain water and whatever else they needed whilst our men watched, too weak to oppose them. Whilst this and similar events were taking place small groups of French crusaders were arriving each day to join the army. Seeing them arrive our adversaries climbed the walls and poured down abuse on our men, because the newcomers were so few and poorly armed, calling derisively: `Fly from the sight of the army, fly from the sight of the army!’ Soon afterwards crusaders began to come in large groups from France and Germany, whereupon the enemy began to be afraid, stopped heaping insults on us and became less bold and confident. Meanwhile the mere of Cabaret, the chief and most cruel enemies of the Christian religion at that time, patrolled the public roads near Termes night and day and whenever they carne across any of our men either condemned them to a shameful death or, to show their contempt for God and our side, most cruelly put out their eyes and cut off their noses and other members, and sent them back to the army. Arrival of the Bishops of Chartres and Beauvais and many other nobles. So matters stood when a number of noble and powerful men arrived from France; Renaud, Bishop of Chartres, Philip, Bishop of Beauvais, Count Robert of Dreux and also the Count of Ponthieu. They were accompanied by a substantial force of crusaders whose arrival greatly cheered the Count of Montfort and the whole army. It was hoped that strong action would result from the arrival of these powerful men; and that they would grind down the enemies of the Christian faith with a strong hand and a stretched out arm. But He who puts down the mighty and gives grace to the humble, through some secret design known only to Himself, wished nothing great or glorious to be achieved by their hand. As far as human reasoning can determine, the just judge so acted either because they were not worthy to be the instrument for the great and worshipful God to do great and wonderful things; or because if great men were to perform any great deed it would be ascribed entirely to human power, and not Divine. So, the Heavenly Disposer thought it better to keep that victory for the humble, so that by winning through them a glorious triumph He might give glory to His own great name. Meanwhile our Count had siege-engines erected of the kind known as petraries. These bombarded the outer wall of Termes, whilst our men laboured day by day on the siege. The Archdeacon of Paris. Present in the army was a venerable man of high honour, William the Archdeacon of Paris. Inspired by zeal for the Christian faith, he had dedicated himself totally and devotedly to the service of Christ. He preached every day, organised collections to contribute to the cost of maintaining the siege-engines and carried out other similar and necessary duties with great enthusiasm. He frequently led large groups of crusaders to a wood and had them gather large quantities of timber for the engines. One day our men were trying to erect an engine near the walls but were prevented by a deep ravine. This man of steadfast purpose and incomparable zeal, in the spirit of wisdom and courage found the solution needed to overcome this obstacle; he led the crusaders to the wood, instructed them to take back a huge quantity of timber, and had them fill the ravine with wood, earth and stones thus providing a level place for our men to erect the engine. Since I cannot describe in full all the planning, care and effort the Archdeacon devoted to the siege, or the burden of work he undertook, suffice it to say that to him more than anyone, save God alone, must be ascribed the unceasing and dedicated enthusiasm brought to the siege and the victorious outcome. He was a man outstanding in piety, wise in counsel, and of a courageous heart. Whilst the siege was in progress God granted him such grace that he was found to be most expert in all things needed for its success; he taught the smiths, he instructed the carpenters, he excelled every craftsman in showing what had to be done to further the siege. As already described, he arranged for the ravines to be filled and again when it was necessary, had the high bills made level with the deep valleys. Attack on the outer bourg. So the siege-engines were set up close to the castrum and employed for some days in hurling missiles against the wall. As soon as our men saw that the outer wall had been weakened by the continuous bom­bardment of stones, they armed themselves with the intention of taking the outer bourg by a frontal attack. Our opponents observed this and as our men drew near to the wall set fire to the outer bourg and withdrew to a higher bourg. However, as soon as our men entered the outer bourg the enemy came out to meet them and quickly drove them out in flight. Such was the state of affairs when our men realised that their attempts to capture the castrum were being severely impeded by the tower of Termenet which I described above, and which was defended by a body of knights, and they began to consider how they might capture it. They therefore set guards at the base of the tower (which, as I mentioned, was built on the summit of a high crag), so as to prevent the men in the tower having access to Termes itself or those in the castrum providing help to the tower if need arose. After a few days our men succeeded, with great difficulty and at great risk, in erecting a siege-engine of the type known as a `mangonel’ in an inaccessible place between Termes and the tower. The defenders in their turn erected a mangonel and bombarded our engine with huge stones, but could not knock it down. Thus our mangonel was able to continue bombarding the tower. The defenders now realised that they were besieged and could expect no help from their comrades in Termes, and one night in fear for their safety they sought protection in flight, leaving the tower empty. The guard at the base of the tower was being mounted by the sergeants of the Bishop of Chartres; they occupied the tower as soon as they saw what had happened, and erected the Bishop’s standard on the roof. Whilst this was going on, our petraries on another side of the castrum kept up a continuous bombardment of the walls. When our adversaries – who were admittedly courageous and astute – saw that the engines were weakening any part of the walls, they at once built a barrier of wood and stones inside at the weak point. The outcome was that whenever our men were able to force their way inside the walls at any place, the barrier built by the enemy prevented there from going any further. As space does not permit one to describe every detail of the siege, ‘I shall simply say that every time the defenders lost any part of their wall they built another wall inside in the manner I have described. Meanwhile our men erected a mangonel in an inaccessible place at the foot of a crag near the wall, which inflicted no slight damage on our enemies when it was put to use. Our Count sent a force of three hundred sergeants and five knights to defend the mangonel; there was great concern for its safety, because our men knew that our opponents would spare no effort to destroy an engine that was causing them so much trouble, and also because the difficulty of access to the mangonel would make it impossible for the main army to help those guarding it in a emergency. One day a force of enemy soldiers, up to eighty in number, protected by shields, rushed out to destroy the mangonel, followed by a huge number of other men carrying wood, fire and other materials for setting light to the mangonel. When they saw the enemy coming the three hundred sergeants guarding the mangonel were seized with panic and fled, leaving only the five knights to maintain the defence. What more? When the enemy drew near all the knights fled save one, William of Ecureuil. This knight, seeing the enemy approaching, began with great difficulty to climb over the crag to meet them; they made a concerted rush against him, and he defended himself vigorously. They saw that they could not capture him, and instead thrust him with their spears onto the mangonel, and threw dry wood and fire after him. This courageous man at once rose up and dispersed the fire, so that the mangonel was unharmed. Once again he started to climb up to face the enemy; once again they thrust him back and threw fire on him. Again he rose up and went for the enemy; four times in all they hurled him onto the mangonel. Finally our men realised that since no one from our side could reach our knight to help him, he would be unable to escape; they therefore went to another part of the wall and made as if to mount an attack, whereupon the enemy soldiers harassing William retired into the castrum. William, albeit exhausted, escaped alive. His incomparable courage had ensured that the mangonel was unharmed. At this time the noble Count of Montfort was beset by extreme poverty, to the extent that he was very often even short of bread, and had nothing to eat. Frequently – I have it on sure authority – when a meal-time was at hand he would deliberately absent himself, ashamed to return to his tent, since it was the time to eat and he did not even have bread. The Venerable Archdeacon William organised fraternities and made collections, as I mentioned above. Everything he collected he spent conscientiously on the siege-engines and whatever else was needed to further the siege: truly an admirable tax-gatherer, a virtuous plunderer? So matters stood when our opponents ran out of water, for our soldiers had cut off the approaches to the castrum and they could not get out to draw water. Lack of water produced lack of courage and of the will to resist. What more? They started to parley with us, and sought to negotiate peace on these terms: Raymond, the lord of Termes, promised to hand it over to the Count provided the Count allowed him to retain all his other possessions; also the Count was to return Termes to him after Easter. Whilst discussions on these proposals were going on, the Bishops of Chartres and Beauvais, Count Robert of Dreux and the Count of Ponthieu proposed to leave the army. The Count begged them to stay a little longer to carry on the siege, and everyone else added their pleas; but as they could not be diverted from their purpose, the noble Countess of Montfort threw herself at their feet and begged them passionately not to turn their backs on the Lord’s business in the hour of such great need, and to give help at this time of crisis to the Count of Jesus Christ, who every day was exposing himself to mortal danger on behalf of the Catholic Church. The Bishop of Beauvais, Count Robert and the Count of Ponthieu were unmoved by the Countess’s prayers, but said that they would leave the next morning and were quite against staying even for one more day. The Bishop of Chartres, however, promised to remain with the Count for a short time longer. The Count accepts proposals for a truce. The Count realised that with the departure of these three leaders he would be left virtually alone, and was driven by plain necessity, however unwillingly, to consent to the terms for an agreement offered by our adversaries. What else is there to say? Talks were reopened with the enemy and the agreement was confirmed. The Count at once instructed Raymond to leave his castrum and surrender it; the latter refused to leave that day, but gave a firm undertaking to hand the place over early next morning. That Divine justice willed and foresaw this delay is most clearly demonstrated by subsequent events; for God, the most just judge, did not wish that the man who had so grossly wronged His Holy Church (and was ready to do still worse, if he could) should escape immune and unpunished after a life so dedicated to cruelty, since – to say nothing of his other crimes – thirty years and more had now passed (as I have heard from trustworthy witnesses) during which the Holy sacraments were never celebrated in the church at Termes. The following night, there was a sudden intense rainstorm, as if the sky had broken apart and the floodgates of heaven had opened. So great was the downpour that our enemies, who had long suffered from an extreme shortage of water, and had for this reason proposed to surrender to us, now found themselves with an abundant supply. Our harp is turned to mourning, the grief of our enemies is changed to joy! They at once became arrogant and recovered their courage and the will to resist. Their cruelty, their eagerness to oppose us, increased, the more so because they dared to think the storm was a sign that some Divine aid had come to them in their hour of need. What a vain and unjust presumption, to boast of help from Him whose worship they despised, whose faith they had rejected! They said indeed that God did not wish them to surrender; all this, they asserted, had been done for their benefit – but in truth Divine justice had arranged it for their downfall. Departure of the nobles. So matters stood when the Bishop of Beauvais, Count Robert and the Count of Ponthieu left the army and returned home, leaving Christ’s business unfinished and indeed in a most critical and dangerous position. If I may be allowed to record what they allowed themselves to do they left without completing their forty days’ service. Indeed the papal legates, aware that most of the crusaders were somewhat lukewarm in their enthusiasm for the campaign and perpetually anxious to go home, had laid it down that the indulgence promised to the crusaders by the Pope would not be granted to anyone who failed to complete at least one full period of forty days in the service of Jesus Christ. At first light the Count sent to Raymond, the lord of the castrum, ordering him to hand it over as he had promised on the previous day. Raymond, however, who now had water in plenty instead of the shortage which had produced his willingness to surrender and who also saw that almost the whole strength of the army was leaving, changed his mind and wormed his way out of his undertaking. However, two knights in Termes who had on the previous day given firm promises of surrender to the Count’s Marshall did come out and give themselves up to the Count. When the Marshal, who had been instructed by the Count to go in person to parley with Raymond, returned and reported what the latter had said, the Bishop of Chartres (who wanted to leave next day) urged that the Marshal should be sent again to Raymond and offer a truce on whatever terms were acceptable to him, so long as he agreed to hand over the castrum. In the hope that it would help in persuading Raymond to agree, the Bishop further advised that the Marshal should take with him the Bishop of Carcassonne, who was with the army, because he was a native of the area and was known to the murderous lord of Termes; moreover the Bishop’s mother – a heretic of the worst sort – was in the castrum as was his brother William of Roquefort whom I have already mentioned. William was a most cruel man, who strove to excel others in hostility to the Church. The Bishop and the Marshal again approached Raymond. Arguments were succeeded by prayers, prayers by threats, as they strove energetically to persuade the tyrant to accept their advice and surrender himself to our Count, and indeed to God, on the basis I described above. Previously the Marshal had found Raymond obstinate and determined in his hostility; now the Bishop and the Marshal found him even more obstinate. He refused even to allow the Bishop to speak privately with his brother. With nothing achieved, the two returned to the Count. As yet, our people did not clearly see that (as I have already said) Divine goodness had ordained matters in this way, the better to forward the interests of His Church. Departure of the Bishop of Chartres. At first light next day the Bishop of Chartres left. The Count left the army and went with him, intending to follow him for a short distance. When he was some little way from the army, a large armed band of our enemies came out of Termes intending to demolish one of our mangonels. The shouts of our army induced the Count to return. He reached the enemy soldiers who were pulling down the mangonel and, quite alone, compelled them willy-nilly to return to the castrum. He pursued them with great courage, and put them to flight not without peril to his own life – the act of a courageous leader and a valiant man. The Count saw that with the departure of these nobles, that is the Bishops and the Counts, he was virtually alone and almost deserted. He was now extremely anxious and concerned, and did not know what to do. He did not want to abandon the siege, but could not stay where he was any longer; he had many well-armed opponents, but few allies of whom most were ill-equipped, since, as I have said, the whole strength of the army had gone with the Bishops and the Counts. Besides, Termes was still very strong and it was felt that it could be taken only by a strong and numerous force. Moreover, winter was approaching and was usually very severe in that region; Termes was situated in a mountainous area (as I have already described), and consequently, what with heavy rainfall, violent winds and an abundance of snow, it was an unusually cold and almost uninhabitable place. Whilst the Count was thus troubled and distressed and at a loss what to do, one day a contingent of crusaders on foot came on the scene from Lorraine. The Count was delighted by their arrival and strengthened the siege. With the industrious help of Archdeacon William, our men regained their spirits and began to work hard on everything concerned with the siege. At once the siege-engines, which had previously had little success, were brought nearer the walls. Our men worked on them continuously and did no little damage to the walls. In some strange way, by the incomprehensible dispensation of God, a marvellous thing happened; the engines, which had achieved little or nothing whilst the nobles and bishops were with the army, began – now that they had gone – to fire with an accuracy that suggested the Lord himself was aiming each stone. In truth, this was the Lord’s doing and was marvellous in our eyes. After our men had spent some time working on the machines and had succeeded in weakening a large section of the keep, one day, the feast of St Cecilia, the Count had a trench carefully dug out and covered with hurdles, which would allow sappers to approach the wall and dig under it. The Count spent the whole day on the preparation of the trench without breaking off to eat, and as night approached – it was the eve of the feast of St Clement – he returned to his tent. The enemy in Termes, with the intervention of Divine clemency and the help of the Blessed Clement, were seized with fear to the point of utter desperation. They at once ran out, seeking to escape. The men of our army saw what was happening, raised a great shout, and began to run hither and thither in order to capture the fugitives. I need delay no longer – many escaped, some were captured alive, even more were slain. A crusader from Chartres, a poor man and a commoner, had joined his comrades in pursuit of the fleeing enemy. By a Divine judgment, he captured Raymond, the lord of Termes, who had found a hiding place, and handed him over to the Count. The Count treated his capture as an unexpected gift; he did not kill him but had him confined to a dungeon in the keep at Carcassonne where for many years he paid a wretched penalty worthy of his crimes. A miracle. There was one event at the siege of Termes which I must not pass over. One day the Count arranged for a small siege-engine, commonly known as a `cat’, to be brought up to help in undermining the wall. The Count was standing near the engine and speaking with a knight. As a gesture of familiarity he placed his arm on the knight’s shoulder, when a huge stone, thrown down from the enemy’s mangonel and falling from a height with great force, struck the knight on the head. Through God’s wonderful power the Count, though he had been embracing the knight, escaped unharmed. The knight received a mortal blow and died. Another matter worthy of note. Another time, on a Sunday, the Count was in his tent celebrating Mass. An incident occurred which demonstrated God’s provident mercy. The Count was standing to hear the Mass, and by Divine intervention a sergeant was standing right behind him. Suddenly a bolt from the enemy ballista struck the sergeant and killed him. No one should doubt that this was the result of Divine goodness; clearly in arranging that the sergeant should stand behind the Count and take the force of the missile, God’s intention was to preserve the vigorous athlete of His Holy Church. After the capture of Termes, on the eve of the feast of St Clement, and its occupation by our troops, the Count led his forces to a castrum named Coustaussa. Finding it deserted he went on to another castrum named Puivert, which surrendered within three days. This translation is from The History of the Albigensian Crusade: Peter of les Vaux-de-Cernay’s Historia Albigensis, trans. W.A. and M.D. Sibly (Boydell, 1998). We thank Michael D. Sibly and The Boydell Press for their permission to republish this text.